The importance of storytelling in marketing communications is not only reflected in the interactive visualizations of the webLyzard dashboard, but also in its analytic services and success metrics. 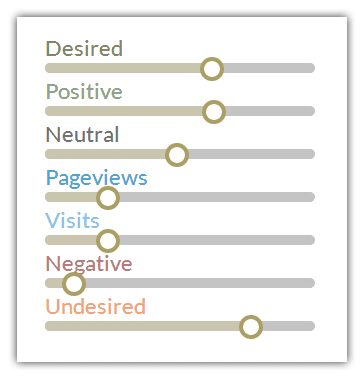 Positive versus negative sentiment reflects the popularity of a brand, company, or topic. The webLyzard Stakeholder Dialog and Opinion Model (WYSDOM) provides a dynamic assessment that goes beyond sentiment and allows real-time insights into the success of marketing and public outreach activities. Measuring attention and sentiment is descriptive in nature. The hybrid WYSDOM success metric, by contrast, reveals whether communication targets have been reached. It measures to what extent the chosen strategy has an impact on observable patterns in online coverage. The success metric also reflects how consistently a message is being conveyed, and whether this message helps to reinforce brand positioning. WYSDOM evaluates the degree of association between an organization (or its products and services) with desired topics considered important and in line with evolving marketing goals. It also determines whether undesired topics and media coverage were avoided successfully. This goes far beyond simple Share of Voice-based success scores or lexical metrics such as sentiment. In the case of the Climate Program Office of the U.S. National Oceanic and Atmospheric Administration (NOAA), for example, a desired association with “climate change” contributes positively to the success metric, although the term typically carries a negative sentiment. The WYSDOM success metric is an adaptive measure and part of an iterative feedback cycle, customized to an organization’s evolving communication and dissemination goals. To specify these goals, analysts have full control over the lists of desired and undesired semantic associations, and the opportunity to update these associations according to changing priorities. The 2018-12 release added the option to store desired and undesired associations together with each topic, in addition to the dashboard default. The Brand Reputation Radar is a visual tool that guides and supports this process. As an optional component, WYSDOM provides seamless integration of Web site analytics via server access statistics such as visits, page views and average viewing time. The data originate from existing log file analysis tools such as Google Analytics or Piwik. The integrated approach allows communication professionals to analyze successful strategies in terms of both their impact on content production (e.g. news articles, social media coverage) and on content consumption (e.g. measure of customer activity on a corporate Web site). The same functionality can be used to render other Key Performance Indicators (KPIs) that reflect marketing success, for example the number of customers, churn rate, loyalty metrics such as the Net Promoter Score (NPS), or aggregated sales figures such as Monthly Recurring Revenue (MRR). The screenshot below shows an interactive representation of the WYSDOM success metric based on a stacked bar chart. Green areas above the horizontal axis represent the association with (i) desired topics and the number of (ii) positive references; blue areas the number of (iii) visits and (iv) page views; the grey area the number of (v) neutral references; red areas below the axis the number of (vi) negative references and the association with (vii) undesired topics. The dark grey line indicates the overall WYSDOM score. Tooltips display additional context information; e.g., topics and opinion leaders responsible for observable changes. The adaptive calculation enables analysts to assign weights to the above mentioned seven components to set their perceived importance. Complementing the layered display of WYSDOM success metric, the information landscape (visual representation of semantic similarity between documents based on a landscape metaphor) is an alternative way to simultaneously assess both sentiment as well as the degree of association with desired or undesired topics. The WYSDOM Success Metric plays a pivotal role in the ReTV Project on Enhancing and Re-Purposing TV Content. ReTV is a Horizon 2020 Innovation Action funded by the European Commission that has started in January 2018. The project pursues a holistic approach and aims at a seamless integration of communication success metrics and prediction models into an iterative content re-purposing workflow. webLyzard will provide metrics extracted from secondary content channels (Web pages, social media postings, accompanying content like snippets or trailers) and associate them with specific TV media assets. The project will extend the existing success metric by: (i) moving from bipolar sentiment to multiple-dimensional emotional categories such as anticipation, surprise and joy, (ii) providing measures beyond awareness, for example a customer’s intent to purchase, and (iii) replacing daily intervals by a shorter timespan granular enough to track the impact of short-term interventions – for example, changes in a company’s advertising strategy. Scharl, A., Herring, D., Rafelsberger, W., Hubmann-Haidvogel, A., Kamolov, R., Fischl, D., Föls, M. and Weichselbraun, A. (2017). Semantic Systems and Visual Tools to Support Environmental Communication, IEEE Systems Journal, 11(2): 762-771. Scharl, A. and Herring, D. (2013). Extracting Knowledge from the Web and Social Media for Progress Monitoring in Public Outreach and Science Communication. 19th Brazilian Symposium on Multimedia and the Web (WebMedia-2013). Salvador da Bahia, Brazil: ACM. 121-124. Last major update with release 2018-12 (Queensland Lizard).